Four Elemental Runestones have appeared on Sapphire, representing the four great primal forces of Water, Fire, Earth and Wind. Together they form the Elemental Runestone system. Warriors who can control this chaotic power will surely gain unlimited strength and become the most powerful warrior on Sapphire. 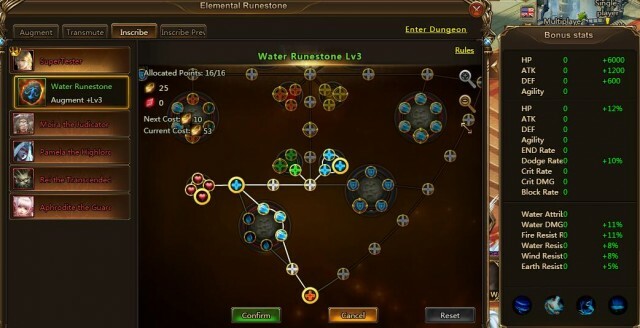 Take a look and learn more about the Elemental Runestone system below. Elemental Runestone has three upgrade paths: Augment, Transmute, and inscribe. Each of them grants you a different power. 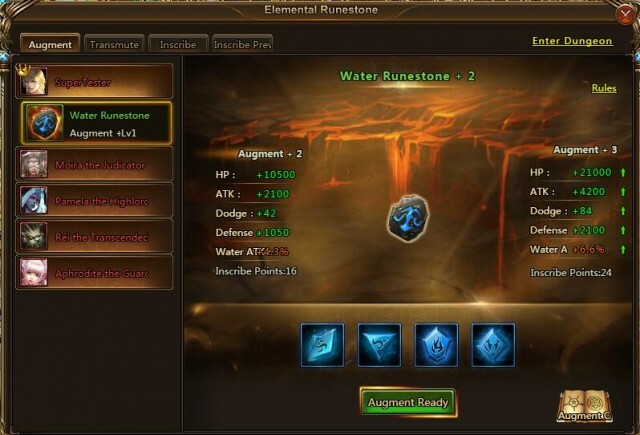 Augment mainly increases Elemental Runestones’ Elemental damage and improves hero attributes. Each type of Runestone has a different secondary hero attribute: Fire - Crit, Water - Dodge, Wind - Hit, and Earth – END. Elemental ATK will increase Elemental DGM. Augmenting Runestones requires using Infinite Crystals. Collecting each type of Infinite Crystal can give different attribute bonuses. Each level of Augment will unlock 8 Inscribe points. The quality of an Elemental Runestone is based on its Augment level. Transmute provides Elemental Resist and Penetration attributes. Sage Stones are required to transmute Runestones. Elemental Resist will reduce Elemental DMG received while Elemental Penetration will negate a portion of the target’s Elemental Resist. Each Element is designed to counter another, so plan according. Inscribe is a more comprehensive way to upgrade Elemental Runestones. Players can strengthen Runestones in specific attributes according to the Hero’s potential. Different nodes provide different attributes. Use Inscribe points and Inscribe Crystals to light up the nodes. The number of available Inscribe points is determined by a Runestone's Augment level and each level gives 8 Inscribe points. You can only activate nodes next to an already activated node. Each type of Runestone has different final Inscribe nodes, providing special attributes and skills. Some nodes will require Advanced Inscribe Crystals. Inscribe can be reset with resources. The new game mode, Dungeon Sweeper, is the main way to get resources for Elemental Runestones. Each player has one free chance to challenge Dungeon Sweeper. 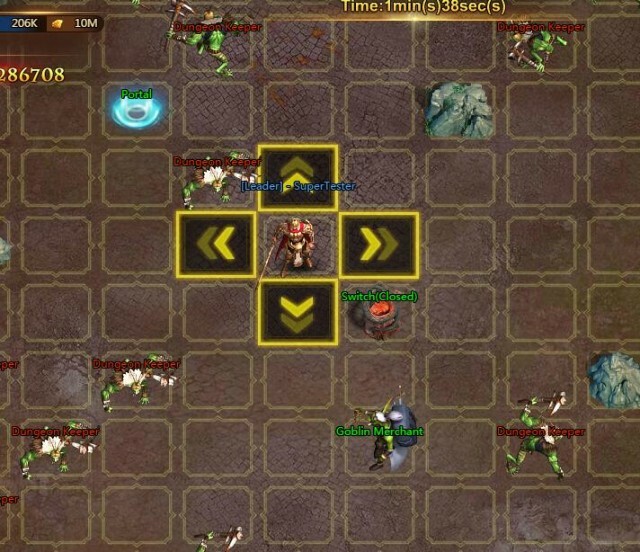 Players can challenge solo or form a team with cross-server friends to explore a new Dungeon filled with monsters, traps, and treasures. All 3 switches in the dungeon must be closed in order to attack the Boss. The team of 3 must work together to get through the stage as fast as possible while earning the most points. Players will get a rating after clearing a stage, based on team's total Points earned and stage clear time. Earn points by killing monsters, bribing monsters, and buying items from the Goblin Merchant. Players can get Wicked Ore, Gold, and other random items after each Dungeon battle. Wicked Ore can be used to exchange for many items from Merchant. 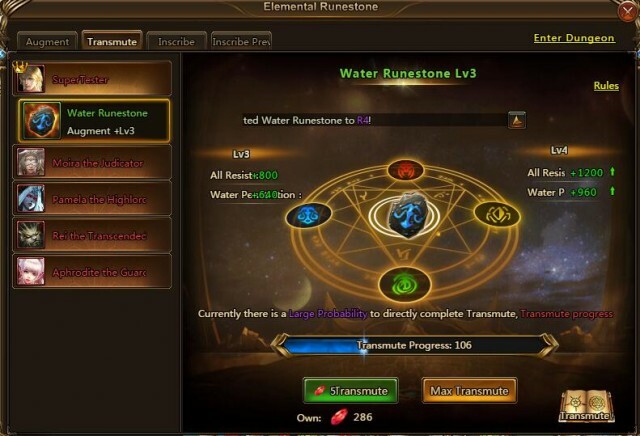 More Elemental Runestone system info will be released in game. Stay tuned!